How Mississippi Polymers Determines CPSIA-Compliance – Mississippi Polymers, Inc.
CPSIA (Consumer Product Safety Improvement Act) is a product safety law focusing on children’s products. These products must meet certain guidelines with regards to their composition and structure. Many of Mississippi Polymers’ films eventually find their way on or in children’s toys, and these films must be certified to be “CPSIA compliant”. The Act covers many areas, but the one of interest to the Plastics Industry involves the regulated use of certain plasticizers. There are six plasticizers (called phthalates) that must not be present in the film (or may not be present over 100 parts per million). We have the ability to test our films to confirm there is no cross-contamination of undesirable phthalates into films that must be CPSIA-compliant. Following is a broad description of the testing process at Mississippi Polymers. A small sample (about 2” x 2”) of film is cut from a production roll and wiped down with rubbing alcohol (photo 1). We have found that oil from hands can often cause a false-positive reading on the CPSIA test. Once the film is cleaned, it will only be handled by someone wearing non-latex gloves. The 2×2 sample is weighed on an analytical balance, and the weight is recorded to four decimal places. 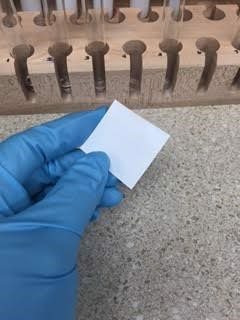 The sample is cut into small pieces, placed in a test tube, and dissolved in THF (TetraHydroFuran). 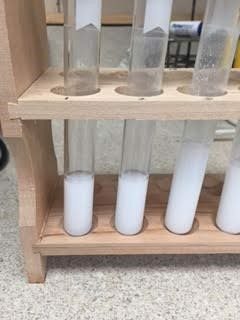 Once the sample is completely dissolved, another liquid, Hexane, will be added to dilute the film/THF mixture (photo 2). The milky liquid is filtered through a fine-mesh filter, resulting in a clear liquid which contains micro particles of the plastic film. 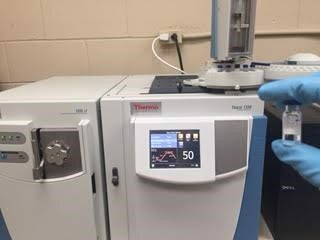 The clear filtrate is tested in a GC/MS (Gas Chromatograph/Mass Spectrophotometer), which is programmed to “look” for the six questionable phthalates (photo 3). If any one of these phthalates is detected, the instrument will determine and report the exact concentration. After the test is completed, a report is issued listing the parts per million of any detected phthalate(s). If none are present in the film, the report will simply state that no phthalates are present above the acceptable limit. Each report is then kept on file, and the customer is notified that the particular lot of film is CPSIA-compliant. There are numerous third-party commercial test labs that perform the CPSIA-compliance test. By testing in-house, Mississippi Polymers is able to certify film quickly for our customers without the added expense or time-lag of an outside lab.